Canine G.I. Support by MD's Choice by MD's Choice offers GUARANTEED RESULTS! Canine GI Support provides highly concentrated, highly digestible nutrients in both a flexible and convenient manner. It is regularly used independently or in conjunction with other therapeutic or treatment programs. This product provides the concentration and flexibility to be used in both the hospital and ambulatory settings. From ulcers to antibiotic-induced diarrheas, feeding the cells and normal floral of the digestive tract will speed recovery times and will enhance existing therapies. May be used in all common GI conditions and can be used for ALL forms of Diarrhea! Amino acids such as arginine, carnitine and glutamine contribute to glycogenisis. Arginine, when provided orally, stimulates local growth factors and cell replication in the digestive tract. Carnitine stimulates protein synthesis and accelerates fatty-acid oxidation, which lowers lactic acid production. It also reduces hepatic fat through lipoprotein production. Glutamine is in high demand during metabolic acidosis. N-acetyl-D-glucosamine is not absorbed from the digestive tract. It is heavily utilized locally when provided orally and is a structural component of all mucosal surfaces. Prebiotics are non-digestible ingredients which selectively support beneficial bacteria in the digestive tract. A proprietary blend of nutrients, specially designed to support the equine GI Tract. Provides large amounts of: L-Glutamine (direct energy source for enterocytes); L-Arginine (rate limiting amino acid in wound healing); N-acetyl-D-Glucosamine (a structural component of all mucosal surfaces); Carnitine (amino acid used in clearing hepatic fat) the pre-biotics Amaferm* and Yeast* (for support of the normal GI flora); Salt* (*only used in the Equine Formula). (FOS (Fructoligosacchirides) & Choline Bitartrate are used in the Canine, Feline, and Human formulas). What Do People Say About MD's Choice Products? Two of our nations top dogs (bomb & drug detection) were suffering from severe arthritic conditions. Our vet tried numerous treatments and supplements, with no outstanding results. With less than a month before a forced retirement of these dogs and the SE Regional K-9 competition (which we didn’t think these dogs could participate in, because of their pain and limited movement) we placed them on a double dose of MD's Choice's Arthrosamine Beefy Chewables, to help relieve their suffering. This turned out to be incredible. We had to hide the supplements because the dogs loved the taste so much that one of them broke into the storage cabinet and ate six whole bottles! Luckily there are no toxic or overdose problems. 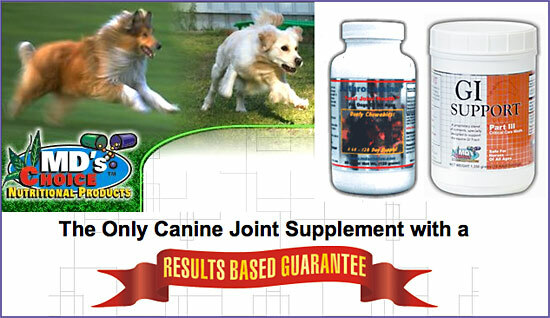 Within a few days, of when these dogs were started on this product, we noticed drastic differences in both movement and actions. The pain was gone! They were getting around without any problems, displayed greater activity, and were eager to please their handlers! Because of the drastic physical changes, we entered them in the regional, where they placed 2nd & 4th! It is unbelievable! No joint treatment or oral supplement has ever helped out dogs more than Arthrosamine Beefy Chewables! After some officers noticed the dogs improvement, they began taking the people supplements. – Sgt. Bob Suarez, K-9 unit Trainer, currently based in Tennessee. Be Sure To Order MD's Choice Products Today! Made in America, and maintaining the same prices, quality, and quantity since 1998! MD's Choice joint & digestive supplements are available through finer tack shops, feed stores, Co-ops, IGA, Purina Stores, and many veterinarians through out America. Also KV Vet, ValleyVet catalogs! Contact us directly if you are having any trouble finding, getting, or want specific directions on optimum use of, our products.